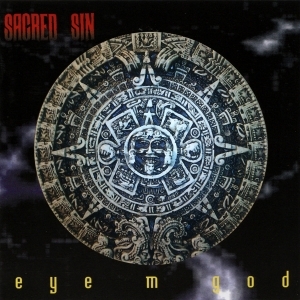 Sacred Sin were / are one of the best known bands from Portugal, initially formed in 1991. They debuted in 1992 with the EP The Shades Behind, followed one year later by their full length debut Darkside (via Portuguese label Musica Alternativa). In 2014 that album was re-released by Satanath Records, Envenomed Music and Rebirth The Metal Productions – I invite you to read the review on that re-release done by undersigned, which was published on the update of December 25th 2014 (+ biographic info, which I won’t repeat right here for you can check it out there). Two of those labels, Satanath Records and Envenomed Music, this time in co-operation with Darknagar Records, do re-release the second full length too, Eye M God, originally released in 1995 via the label Dinamite. It was initially recorded in Portugal’s capital city Lisbon (at the Angel 2 Studio), mixed at the Um Só Céu Studio during Spring 1995, and mastered at Audio Pro by Marsten Bailey. The new edition has been remastered earlier this year at Cave Mastering, and comes with renewed artwork. Strongly within the vein of their debut album, Sacred Sin continue to explore the extremities of the Extreme Music borders. There are quite some influences, undeniable, from the American scene, just like the debut, but the main differences might be the darker sound (blackened, if you want to [and I do want to!!! ]), and the thrashier execution. For one reason or another, the European scene (with the ones from Holland, Poland and Sweden coming to mind especially) is taking over the torch from the North-American one, despite the elementary basics rooted in the Florida- and California-based scenes especially.